Pomegranate seeds – ½ tsp. 1.) Boil, cool, peel and mash the potatoes. 2.) Finely chop the ginger, green chillies and coriander leaves. 3.) Mix all the ingredients for the stuffing and divide into four equal portions. 4.) Make semi-soft dough with the whole-wheat flour using ½ tblsp. ghee and water. 5.) Divide the dough into 4 equal portions and keep it aside for approx. 5 minutes. 6.) Flatten each portion of the dough with the palm of your hand. Place a portion of the stuffing and fold. Pinch off the excess dough. Flatten with a rolling pin to about 7 – 8” in diameter. 7.) 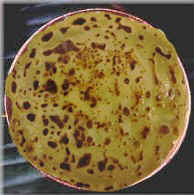 Bake on a heated tawa turning once or twice, applying ghee until golden brown in colour. Serve piping hot. 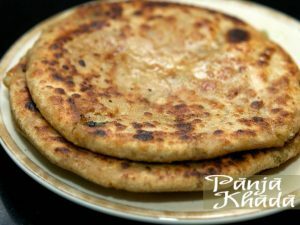 Batatay jo Phulko can be eaten with pickle, curds, raita or a vegetable item. It can be eaten for breakfast or can be served as an accompaniment to a main course for lunch / dinner. deepa & bharat, to win man’s heart a woman needs to cook a hearty meal. but you have won the hearts of all vegetarian around the globe thru bhatia cuisine. keep up the good work. all the best.